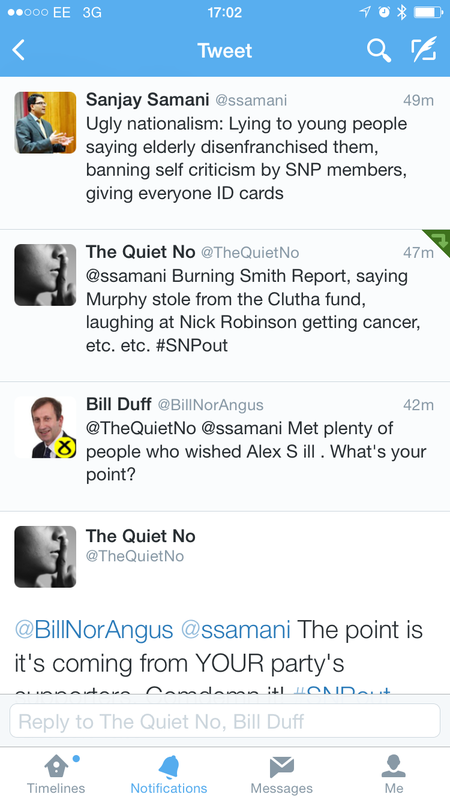 @TheQuietNo @ssamani Met plenty of people who wished Alex S ill . What's your point? Cllr Duff had previously received criticism for a tweet during the referendum campaign in which he described No Voters as “second class Scots”. To excuse horrible CyberNats attacks on Nick Robinson is disgraceful. Bill Duff should withdraw his tweet and condemn the attacks on Nick Robinson. Given the “second class Scots” saga, I seriously doubt that he will. Having watched my mother, father and mother-in-law all lose their battles with cancer, and seeing my wife go through the hell of chemotherapy, I would not wish cancer on anybody. The disgusting comments by CyberNats about Nick Robinson are a new low in the nastiness of the independence debate. I am on record condemning any abuse by both supporters of keeping Scotland part of the UK and by those supporting Independence. I would expect the same from any elected SNP representative and that includes Bill Duff. Like Sanjay Samani I have had many friends and relations who have lost their battles against cancer and Cllr Duff should withdraw his tweet as there is no excuse for such abuse, from whatever source it comes.